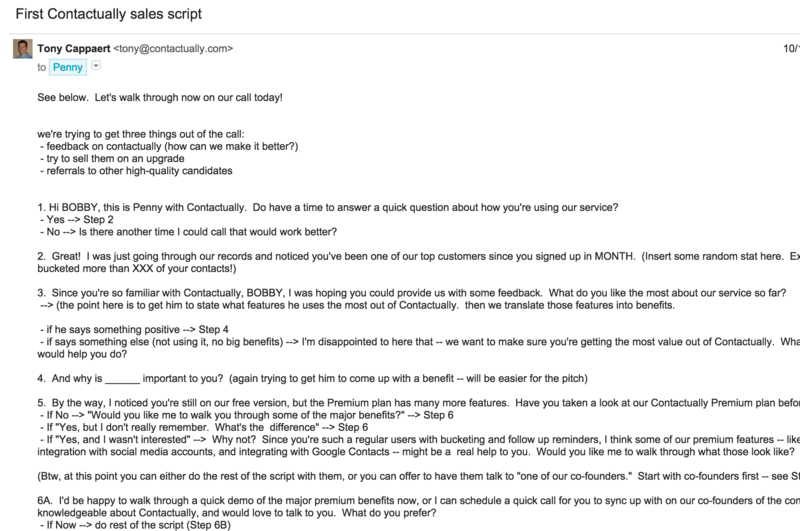 When we started Contactually in late 2011, neither I nor my two co-founders knew anything about sales. Zvi and Jeff were developers, and I was the “business guy”. For the first 9 months of Contactually’s existence, we didn’t charge our customers. We were in beta, so we thought it should be free. (Btw, that was a stupid idea. For more on why, read Josh’s great post on why he charged customers from Day 1 at Baremetrics.) But once we did turn the pay wall on in May 2012, we realized we had to… you know… get people to start paying for it. When we turned the pay wall on, we were getting about 30 trials per day and converting about 5% of them. So every day, we’d close a 1-2 paid customers. We had an automatic notification that would show up in Hipchat whenever a new customer came in. We were making money! Just not enough money. We wanted to grow faster. We thought the fastest path to do so was to hire an experienced sales guy and have him start cold prospecting accounts. You know, smile and dial. I pictured someone hunched over a phone all day, cranking out 100+ phone calls, and closing new customers. We essentially wanted to build an outbound sales machine. Right away, we started getting recommendations from friends and advisors on who we should hire. We ended up pulling the trigger on Pete, and brought him on board as a consultant. He had a ton of experience and his references had nothing but great things to say about him. We hired him, gave him a list of prospects, and told him to start calling. 1 week went by, with no sales. Then 2. Then 3. Finally a month went by, we didn’t close any new sales from Pete’s efforts, and we found ourselves scratching our heads. What were we doing wrong? Pete was just as confused as we were, but we all realized this wasn’t working. We mutually decided to part ways. We took a step back and asked ourselves: rather than trying to build an outbound sales team to cold call a bunch of random people, why don’t we just focus on the inbound leads that were already coming in the door? Why not just try to convert a higher percentage of those leads? OK, easy enough. The process was simple: call every person who signs up, figure out why they signed up, and help them set up and start using Contactually to meet whatever goal they had in mind. Then follow up a couple weeks later to check in, and ask if they want to upgrade. It seemed too simple. But it started to work. As a founder, you’re always the best guinea pig for this type of thing, so I was our first sales guy. But I also had other work that was taking up a lot of my time, chiefly trying to bring in more leads every month (you know, so we had leads we could *actually call*). We didn’t have a lot of money, and we didn’t know how effective calling leads would be. So we posted a job on Odesk (now renamed Upwork) for a part-time contractor to call leads, and we ended up hiring Penny. Penny lives just outside Manila in the Philippines. She had a lot of customer support experience, and was comfortable talking to customers on the phone. We asked her to call customers and walk through a basic script. And it worked! We started to convert more and more customers. We ended up hiring several more Odeskers, both in the US and in other countries. Over the next six months, we increased our conversion rate from 5% to 14.5% by the end of 2012. 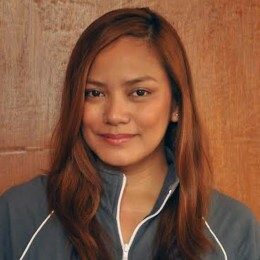 Hire from the Philippines. You can find talented people that speak English fluently and have reliably fast Internet for about $5-7/hour. We experimented with US contractors, but they were less reliable and higher cost. Stick with cheap infrastructure initially. Our sales stack was pretty bare bones in the first few years. We used cheap licenses of Salesforce (the $25/month Group plan) to track leads, Skype (where unlimited US calls were $4/month) to make calls, and CallRecorder ($29 one-time) to record calls. By working with Odeskers initially, we got all the kinks worked out before hiring a more expensive US-based team. Record calls and provide feedback. Technically this probably isn’t kosher, but we did it anyway. We used software to record all our sales calls, and I’d listen to them and provide notes every night. We quickly figured out what worked and what didn’t, and the team got the feedback they needed. Track your results and constantly iterate. We were always trying new things — scripts, times of day we’d call, etc — and we’d track to see what lift the sales reps had on conversion. We saw over time that we increased conversion by about 65% when a Odesk sales rep spoke to a lead vs when the lead was left to convert on their own. Once we had a few months of experience building out our sales process with contractors, we thought the next natural step would be to hire a sales team in the US. Six months earlier, that would have felt like a daunting task. But now that we already had so much of the logistics in place — CRM, scripts, call process — it was only a matter of finding and training good talent. Our sales team of Filipino Odeskers helped us prove out the inside sales model. But in my heart of hearts, I knew we still weren’t that efficient. I thought a US team would allow us to improve and iterate even faster, and we’d better institutionalize a lot of our best practices with a team of full-time employees vs contractors. You need to love learning. We didn’t want people who would just put their heads down and execute; I wanted to build a team who was just as eager and curious as I was figure out how to improve our sales process. You need to respond well to coaching and feedback. We wanted people who were humble, wanted feedback, and were going to seek out coaching to get better and better. You need to be a great cultural fit. These were some of our first hires, and they were going to set the culture for entire future sales team. We wanted to ensure they shared our values and were at least a little weird. Again, we got incredibly lucky. We found three amazing hires — Brent, Susan, and Nick — and helped shape much of Contactually’s early sales practices and culture. Two of them are still with us today: Nick runs all our sales and marketing ops, and Susan pioneered our customer success team. In hindsight, I don’t think any of this was rocket science. We just hired smart people, constantly tested and iterated things, and we improved. 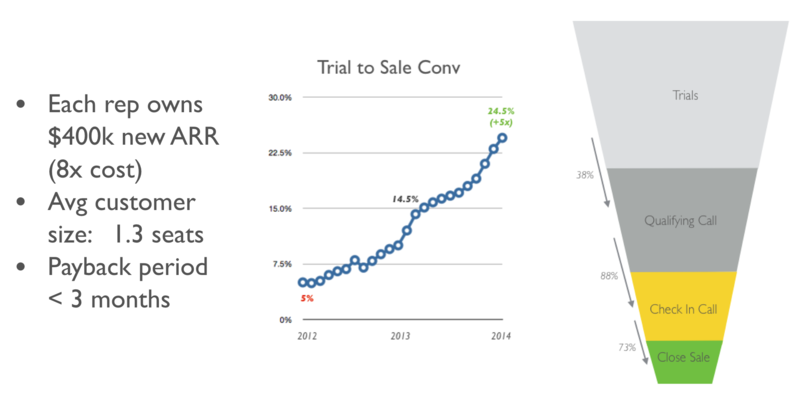 Throughout 2013, our trial -> paid conversation rate continued to increase, from 14.5% in January to 24.5% by the close of the year! We got a better handle on our metrics, and realized we’d developed a process that was truly scalable. And with that knowledge came the confidence to continue to grow and expand the team. We eventually hired a VP of Sales in 2014 to continue to grow and shape our sales team. Our metrics have continued to improve. With our latest round of funding, we plan to double our sales team in 2016. We’ll of course continue to push ourselves to constantly learn, iterate, and improve. While we’ve learned and grown quite a bit over the past few years, I think we’re just getting started. I’d be remiss to write a post about our sales process and future plans without a quick plug for the current openings on our sales team. We’re hiring over a dozen junior and senior sales people over the next year. Interested in joining our team? Shoot me a note at tony at contactually.com!